Welcome to our third Mini Quilt Monday! 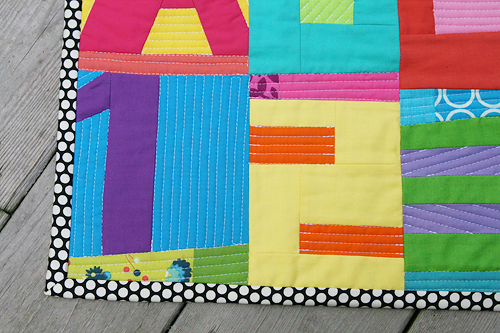 This week I decided to dive right into the book Word Play Quilts by Tonya Ricucci. I recently discovered Tonya's blog, and wow, there is a lot of inspiration on there! I have future plans to make a quilt with some words on it, but I was a bit intimidated when it came to making letters. I'm *pretty* sure I've mentioned that geometry and I don't exactly get along. And this style of letters looked like you needed to know something about that. Tonya's book makes it SO easy! She has step-by-step instructions for all letters and numbers. I also followed tips that I learned during Malka Dubrawsky's Improvisational Piecing class: 1. I followed basic color rules when making my letters. 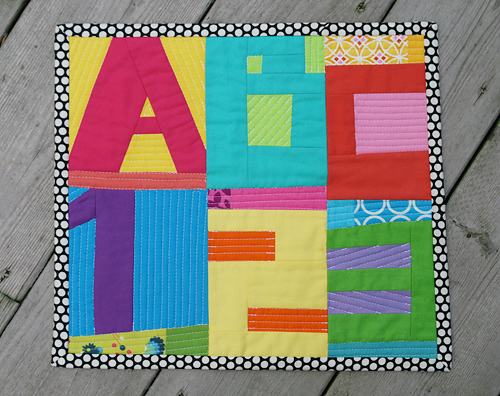 Each letter/number is made with either warm or cool fabrics. I alternated warm/cool/warm/cool/etc. 2. I didn't use my ruler once when making this mini quilt. I freehand cut all pieces with my rotary cutter. If a piece had a slight curve to it, I incorporated that curve into the next piece I sewed on. 3. When sewing letters together, if one letter was smaller than the next, I added fabric to the smaller piece rather than trimming fabric from the larger piece. 4. I used mostly solid fabrics, but incorporated a few prints to add a bit of interest. I know this improvisational style of sewing makes some of you break out into a cold sweat. I won't name names. You know who you are. LOL But I just love how it turned out! I quilted this mini using straight lines in varying directions on the background portions of the letters. As for the fabric, I used a selection of solids from my stash: Kona cottons, Kaffe Fassett shot cottons, Moda crossweaves, Free Spirit Designer Solids and Pat Bravo's Pure Elements solids. Phew! The binding is a Kei Honeycomb. The final size is 14" x 12.5". 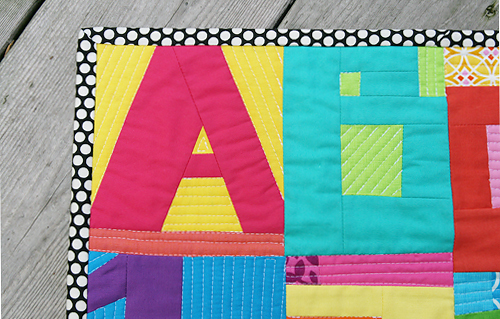 This is one mini quilt I think would look great hanging up in a nursery with little clothes pins. I've added it to my shop. So let's see what you made this week. Link 'em up!